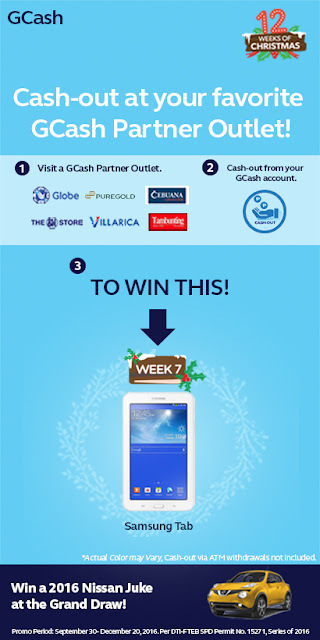 Time to cash-out at your favorite GCash Partner outlet this week and get a chance to win a Samsung Tablet at the GCash 12 Weeks of Christmas Promo. And not only that, you are also entitled to join the grand raffle promo which may be your ticket to a brand new Nissan Juke. Simply withdraw money from your GCash account from November 11- 17, 2016 for the Week 7 of GCash Christmas Promo and win a Samsung Tablet. GCash partner outlets nationwide include: Globe Stores, SM Business Centers, Puregold supermarket, Tambunting and Cebuana Lhuillier pawnshops. You get one raffle entry per GCash cash-out transaction. GCash is a safe, secure, and hassle-free mobile money transaction wallet wherein you can buy prepaid load, pay bills, send money, make donations, do online shopping, and even purchase goods. Every week leading to Christmas, we will be giving out gifts to our GCash customers as they accomplish certain GCash tasks. To qualify for the November 11 – November 17 promo, a GCash customer must successfully cash-out at their favorite GCash Partner Outlet to earn one (1) raffle entry. This week’s raffle draw is on November 18.